The absence of a formal request for the exiled journalists to return to Sri Lanka, has cast a shadow over their return despite several government Ministers’ invitation for them to return. Although informal invitations have been extended by Ministers of the new government including Rajitha Senaratne and Gayantha Karunatilake, a formal request is yet to be made through the parliament by either the Prime Minister or the President concerning this matter. Considering the circumstances in which these journalists fled the country during the previous regime, such a formal request has become vital as fabricated court cases have been filed against some of the journalists living in exile. Journalists who bore dissenting views or criticized the Rajapaksa regime were labelled as ‘LTTE supporters’ and ‘traitors’ and files were opened by the Terrorist Investigation Department on some of the exiled journalists including the Colombo Telegraph editor. However, despite the regime change the Attorney General has not made any promise so far with concern to any possibility of withdrawing such cases. Neither has any promise been made by the new government to expunge such intimidating inquiries or withdraw Airport surveillance. 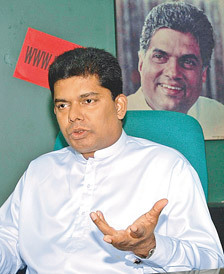 Although the Colombo Telegraph made several attempts to contact those responsible for a comment on the situation, none of them have been reachable.